Scotland's Brexit Secretary says the people of Northern Ireland have been let down by the lack of an executive. SNP politician Mike Russell said the Stormont stalemate has impacted on the wider Brexit debate. He said cross-party discussions about the UK leaving the EU have proved difficult because there are no Northern Ireland executive ministers present. Northern Ireland has been without a government since the power sharing executive collapsed in January 2017. Speaking to the BBC Northern Ireland programme The View, Mike Russell said: "I think the people of Northern Ireland have been let down by not having [a Stormont] administration. "The reasons for that are for the Northern Irish people to discuss, not for me. But I think there has been an added difficulty in these talks, which has been created by that." Since 2017, civil servants have represented local ministers at Joint Ministerial Committee meetings involving politicians from Cardiff, Edinburgh and London. 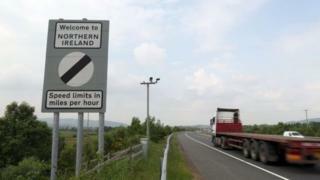 Mr Russell told the BBC: "There has been a good principled representation from the Northern Ireland Civil Service. I sit alongside those people at committee meetings, but I don't think Northern Ireland has been heard." Whilst local politicians have not been discussing Brexit at Stormont, at Westminster it has been a different matter. The DUP's 10 MPs have found themselves centre stage in the Brexit debate over the key issue of the Irish border backstop. The Conservative Party entered into a pact with Arlene Foster's party after the general election in 2017, in order to give Theresa May a working majority in the Commons. The DUP agreed to support the government on all Brexit votes, finance bills, the Budget and a number of other areas, in exchange for an extra £1bn spending for Northern Ireland. Whilst the DUP have the ear of the Prime Minister at Westminster, some Conservatives say different opinions from Northern Ireland are missing. Scottish Tory MSP Adam Tomkins told The View the DUP's voice "is being heard loudly in London at the moment because Theresa May is reliant on DUP votes in terms of confidence and supply, and also, presumably, in terms of the meaningful vote later in March". He added that "other voices in Northern Ireland have not been forthcoming". Mike Russell says the SNP government campaigned for Scotland to be considered a special case after Brexit. However, he claims the Conservative government has not taken their arguments on board. He told the BBC: "I don't think anybody has been listened to, except those who are around the Prime Minister. The more extreme you are, the more likely you are to be listened to by the Prime Minister. I don't think the Prime Minister listens to anybody." However, Conservative MSP Adam Tomkins said the SNP are playing politics over Brexit. "They have weaponised Brexit, not because they particularly care about the terms on which the United Kingdom leaves the EU, but because they are trying to use it to push their own aggressive case for an independent Scottish state," said Mr Tomkins. The View is broadcast on BBC One Northern Ireland on Thursday at 22.40 GMT.